Like so many from the U.S., when I daydream about traveling through Europe, I always imagine myself on a train: speeding quietly through the countryside, over the mountain passes, past charming, ancient towns, or along the shores of a massive glacial lake.Other forms of transportation—with their two-hour pre-flight check-ins, their bumpy, uncomfortable buses, and their too-close-for-comfort seating arrangements—always feel like a hassle. They’re something to get through before the real vacation begins. But riding Europe’s trains has always felt like a joyful, beautiful, and romantic part of the journey. It’s something that enhances my experience instead of delaying it. And so I nearly always find myself choosing to explore Europe by train, even if it sometimes takes a couple more hours and a few more dollars. I’ve traveled this way for years, both when I lived in the States and visited Europe between jobs, and now that I live here in the Swiss Alps. And I’ve discovered that, even though I love nearly every train ride I’ve taken, a few routes stand a little taller than the rest… they unfold more beautifully and leave attentive passengers more breathless than the average ride through the countryside. The following are four of the most interesting, relaxing, beautiful routes across Europe. Each offers something special and majestic, from the lofty peaks of the Swiss Alps to the vast ocean views of the Italian Riviera. 1. La Spezia, Italy, to Nice, France. For coastal-scenery lovers, you can’t get much better than the route between La Spezia—the nearest mid-sized Italian city to the popular and colorful Cinque Terre towns—and Nice la Belle on the French Riviera. This train ride weaves its way along the coastline of Italy and then France, offering striking views of the ocean, the seaside cliffs and candy-colored towns of the Cinque Terre, tiny harbors, and hillside vineyards and olive groves. Towns seem to tumble down cliffsides into the Ligurian Sea where boats bob at anchor. En route watch out for the chiming towers of Riomaggiore and picture the sleek Genoan war galleys that plied this coast 500 years ago. For the best experience, choose a window seat on the left side of the train facing forward. Bring a limoncello aperitif from the Cinque Terre villages, keep your camera on hand, and celebrate your arrival with an authentic French pastry and a walk through Nice’s bustling, cobbled old town. The journey will take you from five-and-a-half to seven-and-a-half hours depending on the number of connections needed, which range from one to two—no hardship given that it means time spent exploring the hilly, cobbled streets. 2. Zurich, Switzerland, to Florence, Italy. For more gorges, tunnels, winding rivers, wooden countryside chalets, and distant mountain peaks, start in Zurich and head southward, to Milan and then Florence, Italy. The highlight of this train ride is the three beautiful views of the famed, baroque-style Wassen Church, as the train loops around it at three different levels. This six-hour route is particularly gorgeous in the winter, when snow dusts the ground and the mountain peaks are a creamy, uniform white. For the best views, choose a window seat facing forward on the left side of the train. And for the best experience, stop in Bellinzona and explore the massive castle, with its views out over the city and to the mountains. You’ll only need to change at one station en route to complete this journey. 3. Geneva to Murren, Switzerland. Though shorter than the other rides I’ve mentioned at four hours, the route from lakeside Geneva—through the valley that inspired J.R.R. Tolkein’s Rivendell and into some of the most famous peaks in the Alps—deserves a mention. This is the perfect Swiss train ride, packing in every central-European landscape you can imagine. It starts alongside Lake Geneva, one of the largest lakes in Western Europe, and then winds its way through quaint farming communities, past dozens of cascading waterfalls, along precarious cliffs with unobstructed mountain views, past glacial lakes covered in sailboats and kayaks, and always toward the jagged, snowy Jungfrau peak in the distance. For the two most memorable views of the entire trip, pay attention as the train passes through Thun and rounds a corner. Suddenly, Lake Thun—deep-blue, glacial, and dotted occasionally with sailboats—appears to your left, flanked by snow-capped mountains on the far shore and colorful, well-kept Swiss villages on the near shore. Then, look again to your left for a panorama of the region’s highest peaks, as your train leaves Grutschalp for Murren on the final leg of the journey. For the best experience, choose a window seat (facing forward) on the right side of the train from Geneva to Bern. Then sit on the left side (facing forward) for every other leg of the journey. When you arrive in Murren, choose one of the cliffside restaurants for a traditional Swiss dinner. Most of the restaurants offer balconies or floor-to-ceiling windows overlooking one of the best panoramas in the Alps. 4. Munich, Germany, to Zagreb, Croatia. For stunning Alpine views and cozy, plush seating, choose the day train from Munich to Zagreb (instead of the overnight option), and settle in for a long, comfortable ride. 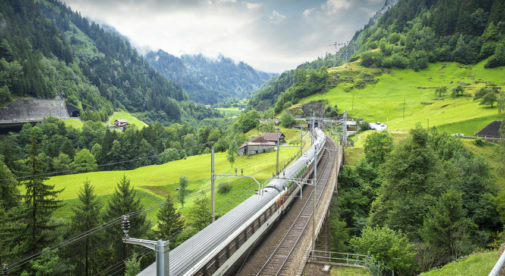 The German and Austrian portions of this journey offer the best views, with rich, green forest and imposing mountain peaks rising up around the train. To make the experience even better, sit on the left side of the train facing forward (where the mountain views will take your breath away). Bring a couple of German soft pretzels to snack on, and celebrate your adventure with some fried calamari and a cocktail in one of Zagreb’s hip downtown bars when you arrive. The journey takes nine hours and you’ll have to make one connection. Whatever scenic route you choose, make sure to wear comfy (though nice) clothes; bring a simple, European-style lunch (fresh fruits, bread, vegetables, or cheese from a local market can add a lot to a multi-hour train ride); avoid putting your feet on the seats (or you may get scolded); and don’t be afraid to spread out a little if the train isn’t crowded. Distance train rides can be a perfect time for journaling, reflecting, and simply slowing things down to enjoy the scenery. At the end of the day, traveling through Europe should be a joy, not a stress. Which is why I skip the airport lines and security pat-downs. I forget about arriving two hours early and simply standing around an airport. And I avoid bumpy, claustrophobic bus rides, even if they are often the cheapest way to travel. Life—and especially vacation—is way too short not to enjoy every moment. And when transportation is relaxing instead of stressful, imagine how much more energy you’ll have to explore your next destination.